This is our fourth year praying the Saint Andrew Christmas Novena, which is prayed from Saint Andrew's Feast Day, November 30th, through December 24th. Each of the days you repeat the same intention; so many people have reported prayers granted and abundant graces through this Novena! As you meditate on the words of the prayer, that joyful anticipation of the Advent season is palpable. 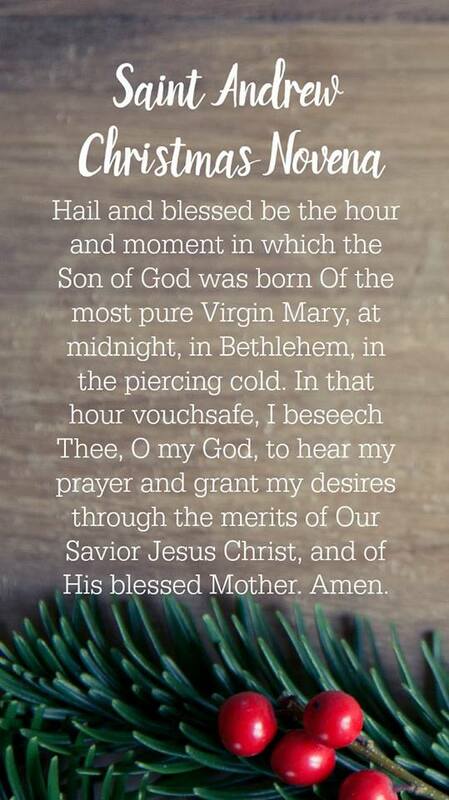 It is a beautiful prayer that has brought our family incredible graces, and I look forward to it every year! The prayer is prayed 15 times a day, and for the last three years my husband and I have prayed it without the children. I usually make the "lock screen" on my phone a graphic of the prayer (you can download that here at the bottom of this post! ), and just count on praying it at least fifteen times throughout the day. This year, with our children a little older and now accustomed to praying the Rosary daily together, we are adding in the full Christmas Novena! Thinking of ways to break it up visually for them, I decided to make felt ball chaplets. My intent was for the older two to be able to string their own, but between the tapestry needles and the thickness of the bakers twine I have, it was a little too tough for them to create these on their own. I made them fairly quickly, and I look forward to having the children use them! We'll be breaking the 15 prayers up, five in the morning, five at lunch, and five before our Rosary. With the felt ball counters, they are able to move the balls up as they complete one of the prayers! And if you need those little reminders throughout the day yourself, below is a graphic that will fit your phone screen for home/lock screens!